Newman continues to trace the history of university education. After its beginnings in Athens and spectacular development in Alexandria, there was a parallel development in the Roman colonies. The approach in Rome and its colonies was different from that of Alexandria. The Roman schools were for younger students and had for the most part had a practical purpose, the formation of government officials. In Rome there were chairs for Latin Grammar and Rhetoric as well as Greek Grammar and Rhetoric. There were chairs also for Philosophy and Roman Law. A professorship of Medicine was added later on. 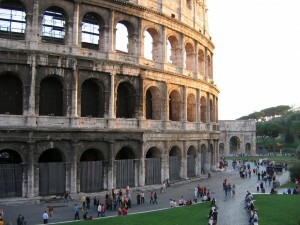 Roman Law was taught in Rome, Constantinople and Berytus. Newman offers more details: “The study of grammar and geography was commenced at the age of twelve, and apparently at the private school, and was continued till the age of fourteen. Then the youths were sent to the public academy for oratory, philosophy, mathematics, and law. The course lasted five years; and, on entering on their twentieth year, their education was considered complete, and they were sent home.” Students of Law and fine Arts were allowed to continue until the age of 25. Youth traveled from Africa and Gaul to study law. They were carefully supervised to avoid the moral dangers of Rome. They required a certificate from the Magistrate of their province, and a “Censuales” or Proctor of sorts ensured that their lodging in the city, studies and conduct were in order. If his conduct was not upright he was public punishment and expulsion to his country of origin. Schools originated in Africa and Gaul. In the latter, the one at Marseilles, Bourdeaux, Autun and Rheims enjoyed a high reputation. Marseilles, which was one of the oldest Greek colonies, was celebrated for its discipline and learning. Respected schools also arose in Milan and in various cities of Spain. From the latter, in the first century AD alone came many writers of reputation such as Lucan, the Senecas, Martial, perhaps Quintilian, Mela, Columella, and Hyginus. Although, unlike Athens, Romans schools were primarily for children (parvulus) or youth (adolescentuli), Rome was also the place where youth already educated went to study Law or other subjects. For instance Rusticus, a correspondent of St. Germanus, and St. Germanus of Auxerre pursued studies in Rome after studying in Gallic schools. After these very significant developments in Greece, Egypt and Rome, was to follow the development of the Medieval University which would be the work of the Catholic Church.